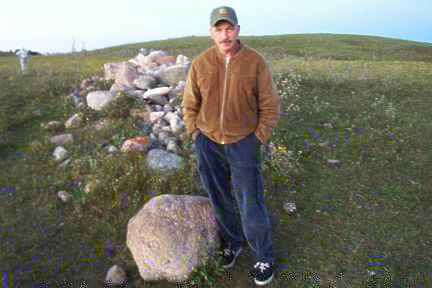 Moncur board member Andy Canada stands by a Buffalo Stone which is directly associated with a central cairn. This cairn acts as the “O” platform/site for a giant medicine wheel over a quarter-mile in diametre. A circle of low hills, a remnant of a glacial delta, were used and modified. Each hillock, like that at the rear of the photo, has a smaller cairn forming a site line with the one shown at centre. The entire site is located roughly on the summer solstice angle from the Turtle’s Back, a distance of approximately thirty miles.